Everyone and everything these days is being reinvented, reinvigorated, redesigned, and remade. It’s all about branding. Recycling is being reinvented as EPR…EPR is being reinvented as recycling. Many of those working on recycling containers, packaging, and printed materials are like those who finally found religion…they think their brand is the best. Some believe that only voluntary efforts can work, while others believe only EPR can work. Some believe EPR only works on packaging but not products, while others believe the reverse. Some say that only toxic products should fall in an EPR system, others say only some packaging materials but not others. The state of recycling discussions in the U.S. today is exciting, but rudderless. PSI was a main force in bringing the product stewardship movement to the United States. Through thousands of presentations, webinars, dialogue meetings, and informational briefings, we helped build the capacity for product stewardship in 47 states and for thousands of local governments. We aim to identify trends, raise issues, develop solutions, implement strategies, and evaluate programs. We connect people into networks. We are not passive facilitators. We forge progress. We do not believe EPR alone is the answer. We believe that voluntary solutions and legislated solutions both have a place at the table. As a facilitative leader, PSI succeeded in developing a national multi-stakeholder agreement on product stewardship. PSI helped stakeholders reach a national agreement with paint manufacturers, retailers, painting contractors, the U.S. EPA, and multiple state and local government agencies. In 2007, PSI helped stakeholders reach a national agreement with paint manufacturers, retailers, painting contractors, the U.S. Environmental Protection Agency, and multiple state and local government agencies. This agreement has translated into three state laws and a national model, and is being rolled out nationwide to ensure a harmonized system. We did this through joint research, and raised nearly $2 million of public-private funding of pilot projects and initiatives that paved the way for the paint manufacturers to become true corporate leaders. 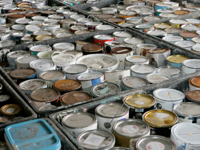 The paint industry, through the American Coatings Association, has taken responsibility for managing leftover paint for the entire industry…over 64 million gallons each year. The agreement PSI helped forge is a huge win for paint recycling jobs, municipal budgets, and the environment. It will save U.S. municipalities about half a billion dollars each year in costs that they would have to pay if they were to properly manage all leftover paint. Yes, paint is different from every other product. However, every product is different from every other product, or package. Each one requires its own strategies and solution — some voluntary, some regulated strategies, and some both. PSI has developed a process that has led to voluntary and regulated solutions on over 15 product categories. 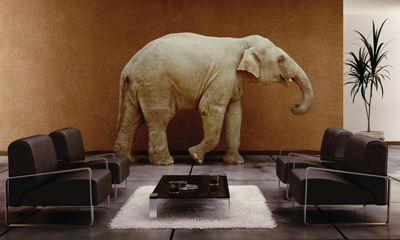 According to the Facilitative Leadership Training Institute, facilitative leaders prefer dialogue to debate and understand the values beneath an opinion instead of arguing over competing opinions. They work toward synthesis and transforming analysis into shared understanding. They respectfully elicit the insights, creativity, and wisdom from others. In their book entitled Breaking Robert’s Rules, Larry Susskind and Jeff Cruikshank say that facilitative leadership is a means to “… getting people to take responsibility for their own futures.” PSI’s paint dialogue became known as the Paint Product Stewardship Initiative, which took on a life of its own as stakeholders became empowered to make decisions as a group. PSI has facilitated change in the product stewardship movement, while keeping the same commitment to honest dialogue. We cannot do our work without you. In the spirit of Emma Lazarus, Give us your weary, old worn out arguments and we will recycle them into a sustainable solution. “EPR’s Broken Promises” — Bah Humbug! Government is so easy to rail against. How great it is to lambast those faceless time-sucking bureaucrats that don’t care anything about Me. How fun to stomp around, spit into the wind, and swear about all that they do wrong. In the latest edition of E-Scrap News (December 2011), the Director of Corporate Environmental Affairs for Sony Electronics, Doug Smith, kicked a lot of dust onto the EPR bandwagon. He waived his arms madly and decried all the failed promises and half-eaten logic of pointy-headed pension-brained cubicle lifers. But by the end of his article, entitled “EPR’s Broken Promises,” Doug was onto something. He was asking us all to consider the programs in Canada and Europe, which resulted in “rational laws” and “protected the current economic markets and developed fair market financing.” Doug is rightly concerned about how government policies can best accomplish laudable goals, as well as to encourage product design changes by individual producers managing their own products. Sure, there is much you might disagree with in Doug’s article. The claim that “[EPR has] no influence on product design” is as unsubstantiated as the definitive statement that it does have influence. Nor does the article fully explore that there are many other reasons why government pursues EPR laws – among them fairness to taxpayers, lowering government costs, environmental benefits, and recycling jobs. It also does not mention that many of the problems with the current laws were caused by electronics manufacturers failing to agree among themselves about what is best policy. Also, the statement that EPR is a “hidden tax” mixes up what is paid for by taxes (most government programs) and what is a consumer product fee (EPR). And the “regressive ripple effect of cost internalization” is a real mind bender. Oh, and my favorite – that no EPR electronics laws except CA’s ARF can claim to create jobs because there is no way to ensure that the jobs stay in the state. But all the hand waving aside, Doug is pointing out the real need to take an honest assessment of the 25 U.S. EPR electronics laws. Which work, and which don’t, and why? What can we learn from laws in other countries? How have these laws performed relative to lowering costs, saving governments money, increasing recycling, creating jobs, and creating a level playing field? What are the policy best practices, and should these be woven into a new federal law that covers all the states? Emotions can often run high with EPR. After all, the movement has created a paradigm shift of tectonic proportions that has changed the dynamic of how waste in the U.S. and globally is managed. For electronics EPR in the U.S., it is time to step back and assess the situation in a balanced manner – with all the stakeholders at the table. Every two weeks, PSI members and partners receive updates on product stewardship news from around the world. A recent NY Times article on battery recycling caught my attention because it illustrated how product sustainability requires a full lifecycle perspective — not only a focus on end of life. The December 8 front-page story described how processing methods used at a Mexican plant for recycling vehicle and industrial batteries from the U.S. are poisoning workers and citizens. The batteries are recovered — mostly voluntarily — at a very high rate in the U.S., without the need for an extended producer responsibility system, because there is great demand for the lead in the batteries. However, those collecting the batteries are skirting U.S. laws by shipping the batteries to poorly run facilities in Mexico. The money saved by companies is at the expense of the health of workers, citizens, and the environment. It is also at the expense of U.S. companies that are abiding by more protective standards in the U.S. There is truly no such thing as a free lunch. We need to level the global playing field so that U.S. companies do not lose business to companies operating abroad under insufficient standards. We should require U.S. companies to certify that they are using material processors that truly protect the environment all throughout the product lifecycle. This is real product sustainability. It is time for U.S. citizens to demand global environmental and social standards of protection for the products they consume. That Used to Be Us. The title of Thomas Friedman’s latest book sounds like a deep dark downer. Instead it is a wonderful framing of problems we face as a nation and the steps we must take to get back in the driver’s seat. As with many large macro-scale issues affecting our nation, we can also see them reflected at a micro-scale, in this case in the product stewardship movement. And, not surprisingly, the authors plead for producer responsibility policies in the U.S. to capture lost jobs to China, highlighting the plight of one California-based electronics recycler, Mike Biddle of MBA Polymers. Written with Michael Mandelbaum, the book’s thesis is “…that China’s educational successes, industrial might, and technological prowess remind us of the ways” we used to be as a nation. Friedman and Mandelbaum focus on four challenges that we must address as a nation – globalization, the revolution in information technology, the nation’s chronic deficits, and our pattern of excessive energy consumption. The book also highlights one common theme that undercuts the malaise that runs across our country’s attempts at problem solving – a disdain for government and a firm belief in the myth of absolute free markets. To me, this is one of the biggest hurdles we need to overcome. One of my first jobs out of college was with the New Jersey Department of Environmental Protection. I was hired to write permits for companies discharging effluent to groundwater and surface water. I had little educational training, and was not provided training on the job. I arrived at the industrial facilities with a checklist of To Dos, with little knowledge of what I was doing. I was matched with engineers and scientists with years of experience that dwarfed my understanding. And yet I was required to write a certain number of permits each week. When I asked policy questions of my management, I was told to keep writing permits. If I was one of the companies I regulated, I would be tempted to think that all government officials were losers. This is the attitude that grew among businesses in the 1980s and has gained steam over the past 30 years. Ronald Reagan made a career of denigrating government officials, and the Tea Party considers it hallowed ground. But I didn’t jump on the pile of government bashing. Instead, I quit my job, went back to school, and sought to become a different kind of government official, one that fostered free market competition with sensible rules. There are many of that type of government official out there, and they are now in the majority. But no one wants to notice. Instead, we continue to hear uncompromising anti-regulatory dogma. I yearn for a more healthy balance. Just as jobs and the environment go hand-in-hand, so do regulations and the free market economy. In fact, without this balance, regulations will choke progress and the free market will result in corporate excesses requiring government bail-outs. Again. Why is it that the government we rely on to correct market failures is so criticized for its attempts to tame the beast? And why is it that those whose products cause external costs on our society believe that voluntary solutions are the only solutions that exist, and that government should back off and let industry police itself, even when the evidence suggests over and over that this is not possible? The balance between government regulation and the free market economy has gotten horribly out of whack in the U.S. The Product Stewardship Institute was founded on the principle of collaboration with industry. We spent countless hours explaining the concept of externalities, documenting actual costs to government and the lost jobs owing to pure waste of valuable materials. We jointly identified common goals, uncovered barriers to reaching those goals, and explored possible solutions. Data prove that product stewardship systems reduce external costs and turn wasted materials into jobs and economic value. Only a few U.S. industries are willing to accept this truth. Others fight. The more we have succeeded in passing EPR laws, the more that companies have placed their bets on the corporate wheel of fortune. They have slowed legislation through lobbying, reducing their own corporate costs while imposing continued costs on the environment and government. There is no doubt that corporate change is hard to achieve, especially when those with the power are benefiting unfairly. If this sounds familiar, it is no wonder that Occupy Wall Street has struck a chord with Middle America. While those in tents plead to remedy a range of inequalities, those promoting product stewardship can rest assured that their micro-issue has resonated with the macro-issues facing our nation. It is time for balance and time for change. That really can be us. Last month, as the Product Stewardship Institute celebrated its 10th Anniversary at our national forum, a new coalition of manufacturers seeking voluntary programs announced its creation. The Product Management Alliance (PMA) launched a press release stating that it seeks to “…support voluntary market-based extended producer responsibility efforts and voluntary incentives for increased recovery and sustainable product and package design.” PMA is comprised of manufacturers of carpet, electronics, toys, paper, packaging and transportation materials, mattresses, plastics, personal goods, and pharmaceuticals. But while voluntary programs have a definite role in reducing the health and environmental impact from consumer products, they are no substitute for balanced regulation, which is often a better way to foster innovative market-based solutions. One good place to start is with the facts. Voluntary, market-based approaches will result in high collection rates only when a product has value at the end of its useful life greater than the cost to collect and transport that product to a secondary market. For example, many retailers collect toner cartridges because they can refill and sell them at a profit. No regulations are needed because the value of the used cartridge is greater than the cost to collect, transport, refurbish, and resell the refurbished cartridge. Retailers have the incentive to heavily market the return of those cartridges. In another example, a car battery left on the curbside will magically disappear because some enterprising scrap dealer will always pick it up and bring it to market for the value of the lead. Unfortunately, though, the cost to properly manage many other consumer products – including carpet, mattresses, electronics, toys, and all the other products whose manufacturers have formed the Product Management Alliance – is much greater than the market value of the used product. After nine years and a signed agreement, the carpet industry’s best efforts to put in place a voluntary collection and recycling system has resulted in the recycling of only 4.5 percent of all the carpet available for recycling in 2010. The rest of that carpet material – more than 95 percent, or nearly 2.9 million tons – was disposed of in landfills and incinerators. Not only was this material wasted, but it causes operational problems at these disposal facilities, resulting in extra costs. The 13-year old voluntary industry thermostat recycling program reached only a 5 percent recycling rate before governments started to regulate. And the voluntary industry recycling program run by the rechargeable battery recycling industry for the past 17 years has posted only a 10-12 percent rate. Wasted resources result in lost jobs and economic value. This is not a band wagon to hop on and emulate. Don’t get me wrong. PSI supports voluntary programs under certain circumstances. Voluntary programs work well as a ramp up to regulated programs. They can grease the wheels so that, when a regulated system kicks in, the players know what they are supposed to do. These programs can also allow an industry leader to spark an innovative program. PSI worked with Staples in 2004 to develop the country’s first computer take-back program, which was piloted, then scaled nationally after two years. This voluntary program is available to everyone, and it resulted in innovative programs by others in the office supply sector, such as Office Depot and Office Max, as well as Best Buy. And voluntary programs can operate in areas where no laws, or weak laws, are in place. But relying on manufacturers to voluntarily collect their products is like trusting that people will stop at intersections with no stop lights or signs…and no threat of enforcement. Some people will have the sense to do it, but most will not. This is why the environmental movement was born nearly 50 years ago. It was because the market cannot police itself, resulting in environmental externalities in the form of pollution that impacts all of society. Do we really have to explain this concept all over again? Have we regressed this much? Imagine a professional ballgame with minimal rules, no common goals, and no referee, where each player performs according to his own definition of success, and where there is no penalty for not playing. Like this imaginary game, voluntary product stewardship programs create a competitive advantage for those companies that will not act unless forced to do so. And, in every case, there will be a significant number of those companies. This reticence is unfair to those corporate leaders that know what is needed, have the ability to reach high performance, but get dragged down to the least common denominator. The buzz among the product stewardship community is that the formation of the PMA is an indication that the product stewardship movement has gained steam, attention, and credibility. There is an interest in finding ways for voluntary industry initiatives to integrate with regulated programs. But there is also a concern that PMA is promoting voluntary programs to block sensible laws that will require them to take greater responsibility, even if the results will be better for the common good. There are other concerns about voluntary programs. Since they rely on the good will of companies, they could be here today but gone tomorrow. And it is often hard to know how effective they are since program operations are often not transparent, and companies selectively report data. For the past 30 or 40 years, there has been a creeping sense among some in politics that all government officials are inept bureaucrats tying companies in knots, preventing job growth, and wasting investment dollars for little benefit. To be sure, those officials exist. But most officials I know are interested in using their authority to create a level playing field for fair competition that will result in more recycling jobs from materials that previously polluted the environment. They want to set broad performance targets and allow companies the flexibility they need to innovate and reach the targets at minimum cost. That is the type of balanced regulation and progress we need. Government product stewardship regulations will result in fair and effective systems. Voluntary actions will not. Last month I was fortunate to have been asked to present at the Northeast Resource Recovery Association’s 30th anniversary conference. One of my assigned topics was “Product Stewardship in 30 years.” Initially, this task seemed daunting…until I realized that I could say almost anything since no one knows exactly what will and won’t happen 30 years from now. As I combed through my litany of what-could-bes, I considered the notion that 10 years of U.S. product stewardship might have finally positioned us to reach far upstream to reduce product impacts, and set us on the path to true sustainability. I even went so far as to say that the current conservative Congressional winds might just open the door to the removal of subsidies underpinning product un-sustainability. During the question-and-answer period, one of our friendly participants asked me if my cause for optimism was justified. After all, many conservative politicians don’t give a hoot about environmental protection if it means that industry and consumers must pay for added social and environmental protections. Yet members on both sides of the political firestorm are increasingly focused on eliminating subsidies (tax breaks) due to a panic-inducing budget deficit. First on the chopping block are ethanol subsidies. Some thirty years ago, when a confluence of circumstances pushed the concept of alternative fuels to the forefront of Congressional consciousness, those growing corn for use in ethanol production received handsome federal subsidies. No thoughtful lifecycle assessment determined if this industry was sustainable. And there was no widespread public debate on the various potential alternative fuel opportunities. But in the heartland there was a focused political interest feeding off homegrown corn that couldn’t be eaten. Age-old ag subsidies, totaling $30 billion over the next decade, are now under attack as anti-subsidy proponents point to biofuel mandates that preempt the need for ethanol subsidies. The political equation is fraught with fretting, yet the slash-and-burn, subsidy-removing, equalizer sword that conservatives wield at the peril of losing the Iowa primary could effectively level the playing field for sustainable energy as well as sustainable products. And many appear eager to use it. I am fully supportive of the strong backlash against subsidies. The Product Stewardship Institute’s main objective is to level the playing field for products. Focusing on a product’s end-of-life management is a huge task. But let’s face it, that movement started over 20 years ago in Europe and Canada, and spread to the U.S. 10 years ago. That movement is in full swing. The movement begging for attention relates to the unequal playing field created by subsidies, which causes truly “green” products to be at a competitive disadvantage to those products that only claim to be green, or products that cut consumer price tags but raise societal costs. This is the next phase of the product stewardship movement. One of PSI’s goals is to encourage consumers to choose products based on their environmental and social attributes. That is a huge endeavor, considering those attributes often fall behind in product effectiveness, price, and availability. We are still unable to thoroughly and accurately compare the environmental and social attributes of different products. PSI’s green washing webinar highlighted the plethora of environmental claims, certification companies, and public confusion over which products are truly environmentally preferable. But if we look behind this external curtain, we begin to understand that the product manufacturing system must be challenged. Mining subsidies (150 years old) give millions of dollars each year to companies that extract raw materials from the earth at a time when we are desperately trying to promote the use of recycled materials. Additionally the lack of company requirements for clean-up operations has left 500,000 abandoned mines, polluted 40 percent of western watersheds, and racked up a bill estimated between $32 and $72 billion (not including currently operating mines). We know similar subsidies occur in other sectors like the timber and virgin paper production industry, which allows special tax rates costing taxpayers $440 million a year. Another recent PSI webinar, on mining subsidies, captured these excesses. If we look closely, there are subsidies everywhere, particularly if that term encompasses society’s subsidization of companies that do not internalize the true costs of their products. And that is the heart of product stewardship. Our movement, across the entire product lifecycle, seeks to require companies to assume the full costs of making products. I do not want to subsidize corn growers for making ethanol, thermostat manufacturers for making sure their mercury thermostats get collected, mining companies for extracting gold to be used in electronics, or any company for costs that society must bear because of that company’s business decisions. That is a long way of saying that, yes, I am optimistic that now is the time to sound the subsidy issue alarm, and to level the playing field for those businesses truly seeking environmental and social equity. I have no illusions that those rallying for subsidies will stop, or that others will join the effort. But the time is ripe to bring these issues into greater focus and educate ourselves and the public about what we really mean by product sustainability. Businesses and governments have finally begun to get the message about product stewardship. Now it’s time to take full advantage of the most powerful weapon in our arsenal – the public. Okay, enough with the military imagery. Even though advancing product stewardship can seem like a war sometime, it deserves a better analogy than that. How about this: It’s time to finish this fantastic green building we’re constructing. We’ve laid the foundation, and built the walls, thanks to a growing number of progressive businesses and governments. Now we need to put the roof on that sucker, by making public awareness of product stewardship a real priority. With public support, more product stewardship legislation will get passed, and better laws will get crafted because legislators will know their constituents support them. 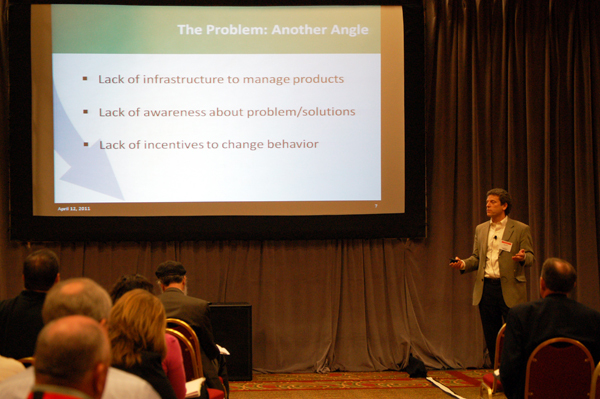 When the public becomes fully engaged, they’ll tell us what they want from product stewardship. We need to listen to them, because that will make the whole movement better and more sustainable. How do we bring the public in to the product stewardship tent? The first and hardest thing is to make a little time in our schedules for public outreach. Take an hour or two a week to write an article for a community newspaper (or, if it’s great, go ahead and submit it to the New York Times), or pitch a local radio interview, or talk to a senior group (seniors are interested, and they vote). If you have someone in your office who is fluent in Spanish, ask them to work with you on an article about product stewardship for the local Spanish-language newspaper. If you have a successful product stewardship law in your state, have your agency do press releases or media events to show how successful it’s been. I know – Public outreach and dealing with the media is messy, and makes our bosses nervous, because we don’t have as much control of the message as we would like. But it can also be fun, if you can find someone in your organization who actually likes to do it. That’s key – don’t try to force someone, including yourself, to do public outreach if you really hate it. The messenger needs to be passionate about product stewardship, and be a people person, and want to share that message with folks. We really don’t have a choice anymore. If we want product stewardship to survive and grow, the public needs to jump on board. There we go – a nice train analogy. I love it. Let’s get everyone on the train and blow that damn whistle for product stewardship! Edit: visit PSI’s Flickr page to see some photos from the 6th Annual Walmart and Sam’s Club Sustainable Packaging Exposition. Over the past few years, Wal-Mart has successfully shed its image of fueling America’s thirst for low-cost consumption to become a leader in the emerging field of sustainability. Recently, I had the opportunity to speak about product stewardship at Wal-Mart’s 6th Annual Sustainability Expo in Bentonville, Arkansas. My message was that companies have a unique responsibility to be stewards of their products across the entire lifecycle, and that government can be a good partner. While that message was embraced by many company leaders, I also ran into a tsunami of market-based mania that fears change and uncertain outcomes. Bentonville is a mix between Rockwell-like farmland with horses and cattle roaming in fenced-in plains…and company row houses. 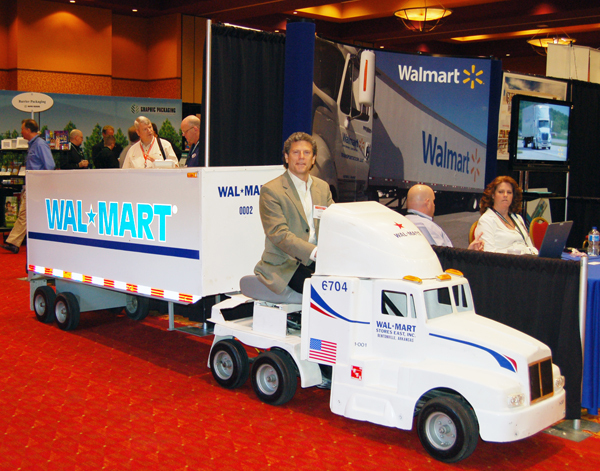 The Expo was located at a hotel that became a Mecca for hundreds of Wal-Mart suppliers, each touting sustainability claims that were verified by PSI partner, EPI, which after six years of Expos, still found the need to correct the claims for two-thirds of the vendors prior to the show. Every commodity association was there – paper, aluminum, plastic, glass, metals. Every consumer packaged goods company was represented, like Colgate-Palmolive, Kraft, Unilever, and P&G. Companies were selling eco-packaging, defined in innumerable ways. And the Product Stewardship Institute was there, with our spiffy table-top display. Coupled with the vendor booths were three morning presentations, one after the other, two at a time. The rest of the day was free to view the exhibits and mingle. I presented at one of the sessions (twice) and sat in on several of the others. Wal-Mart puts a tremendous amount of effort into defining sustainability for itself and its suppliers. Wal-Mart’s Scorecard compares suppliers on a range of sustainability criteria so that buyers can make decisions based on environmental factors as well as the usual price, quality, and other variables, although I did not hear anything about social criteria (child labor, worker issues, etc.) being measured. The presenters went into painstaking detail about how suppliers are to fill out their Scorecard. The room was packed, and people were paying close attention. I asked several suppliers what motivated them to make changes towards sustainability. “Because Wal-Mart’s asking us to do it,” was the reply. Perhaps then it should be no surprise that some companies did not take kindly to being told they have a corporate responsibility in the form of product stewardship, and that there was a strong role for government. This is a crowd that runs on voluntary programs, that is motivated by the market, and wants to keep government about the size of a pinhead. They are motivated by cost savings from sustainability, and have not thought much about the environmental impacts of their products when consumers no longer want them. I took the challenge, and told them about market failures, and about the four tons of mercury going into the environment each year from the disposal of thermostats despite a decade-old voluntary industry program. I made the usual case for jobs, economic value, environmental protection, and taxpayer savings. I described how PSI developed paint legislation jointly with the American Coatings Association, and how this has resulted in the expansion of the recycled paint manufacturing sector, just as legislation on electronics spurred huge growth in the electronics recycling sector years ago. There was much positive response to what I discussed. However, I also learned that many companies are threatened by product stewardship. One senior executive of a pharmaceutical giant knew all about the Product Stewardship Institute (PSI), including our national dialogue on medical sharps two years ago. His company is a major manufacturer of insulin and uses medical sharps as a means of delivering its medications to patients. He said he did not participate in our sharps dialogue because his company was not prepared to state its position. He complained that the dialogue was not developing solutions for real patients and that we didn’t know what patients wanted (even though we had patient advocate groups, sharps manufacturers, and other pharmaceutical companies at the table). During PSI’s two-year dialogue on medical sharps, we sketched out a statewide pilot project for the collection of sharps through various methods so we could evaluate the costs and complexities of such a model system. Unfortunately, the time and expense of developing the background information, reaching solutions, and designing a pilot came up short because the few key pharmaceutical companies (like this guy’s company) that needed to make a commitment refused to participate. Now, two years later, after billions more medical sharps have been disposed of in the trash, and after more worker injuries and added medical costs, I was told that this major company is working on an industry voluntary solution. He indicated he didn’t want any help. Later, I saw a colleague from the American Chemistry Council and we talked about local government plastic bag bans and taxes, and how the Illinois legislation that requires producers to pay for recycling programs might be an interesting model, one that ACC and local governments in Illinois support. I then talked with one of ACC’s members and a founding member of AMERIPEN, the new lobbying group for consumer packaged goods companies. This person had attended my session, objected to EPR for packaging, objected to my slide on the benefits of EPR, and saw plastic bag bans as EPR which, by the way, she objects to. All in all, I came away very impressed with Wal-Mart’s ability to motivate companies with the shear force of market optimism, its ability to stay on message with so many dedicated senior staff, and the results they have achieved. I also came away knowing that many companies and individuals shut down their communication because of fear about changes that product stewardship might bring. These people stop progress for themselves, their companies, and the social good. They are indicative of companies that will find themselves at the back of the pack in making the changes they need to stay competitive. They are risky investments. I do not expect full agreement with the product stewardship message. But if a problem exists, such as waste, environmental externalities, pollution, lost jobs, and unnecessary costs, we need to put our heads together to come up with the answers. Company representatives that want government to wait until their company has an iron-clad position will only harden opposition to a joint solution. As always, the Product Stewardship Institute is ready for discussion. We are ready to change our understanding of issues…because that is what happens when people talk to one another. But when problems persist, or if companies bury their heads, don’t expect PSI to stand by idly waiting for companies to finally decide they are ready. Where is the corporate responsibility in that? Where is the individual responsibility and personal commitment needed to take care of problems that products cause? If you work for a company and you don’t act now, try explaining that to your grandchildren. Last week, I traveled aboard JetBlue to Florida for a family visit. I emerged unscathed through security and was greeted by friendly smiles by the flight attendants. After settling into my seat, the food and beverage service started. Anyone remotely sensitized to sustainability issues knows that the airlines need to step it up several notches in this area. Few of them even recycle their aluminum cans. The utensils, plates, and packaging are disposable. To be sure, airline sustainability takes the notion of “away from home” recycling challenges to a new (and higher) level. But NOT recycling aluminum cans is just plain lazy. There I was on JetBlue headed to the promised land of sun, far from the cold of Boston. I was reciting my mantra-like reflection on environmental airline woes when I was struck by another blow to my environmental sensibilities. Those friendly flight attendants were passing out free samples…of disposable toothbrushes! Don’t get me wrong. I will be the last person to tell some stinko-breathed person next to me NOT to use a toothbrush, even one of these mini 3-inch ones. But come on! Is this really what the Colgate-Palmolive Company should be inventing in this day and age? I was doubly surprised since the company is taking a leadership role in a national dialogue aimed at reducing packaging waste. Is Colgate’s mini toothbrush recyclable? Compostable? Biodegradeable? Is this the most sustainable solution to controlling bad breath? What about gum or breath mints? What about carrying a regular toothbrush with you? People gobbled up these free samples, and I (somewhat sheepishly) requested one so I could write about it. With products like disposable toothbrushes coming onto the market, it is a signal that well-meaning companies are still heading in the wrong direction, at least on some of their products. They need to hear from us that such products are a thing of the past. As for me, for a product like this, I will support companies like Preserve, which makes a toothbrush that is made from recycled plastic and is recyclable. Speak up. And when you open your mouth to brush, think sustainability.